Each item at Blue & White has a history. But once in a Blue Moon, a blue & white wonder lands on our doorstep uninvited, unexpected. We only need to reach out and grab it and share it with the world. 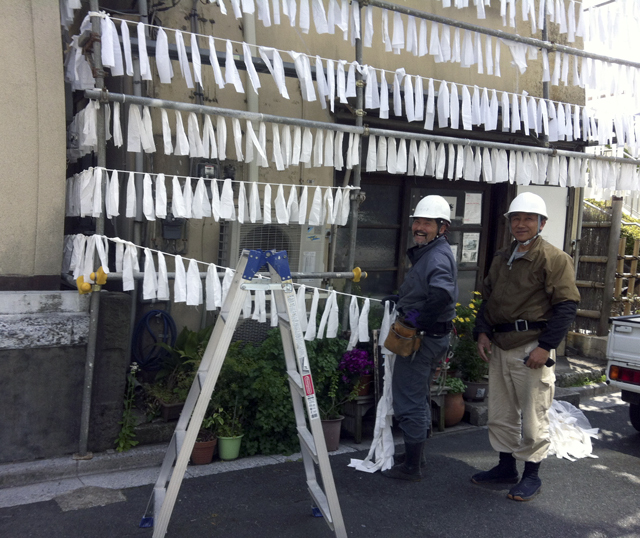 Such is the case of the miraculous Weather Station by Fujii Tatsunori that he and his sidekick installed for 5 days, just outside our living room window across the lane at Bansho Gallery in Tokiwa, Koto ku, Tokyo. 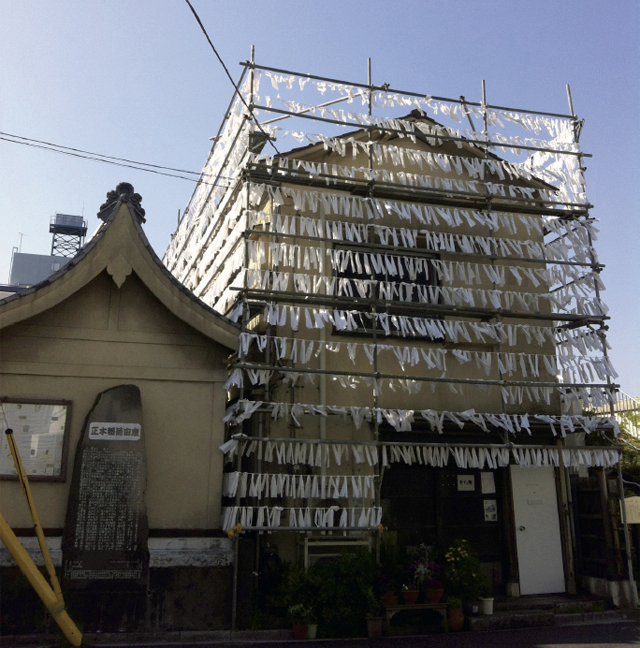 The exhibit, both outside and inside of Bansho Gallery opened on May 1 for one month. The preparations took time. 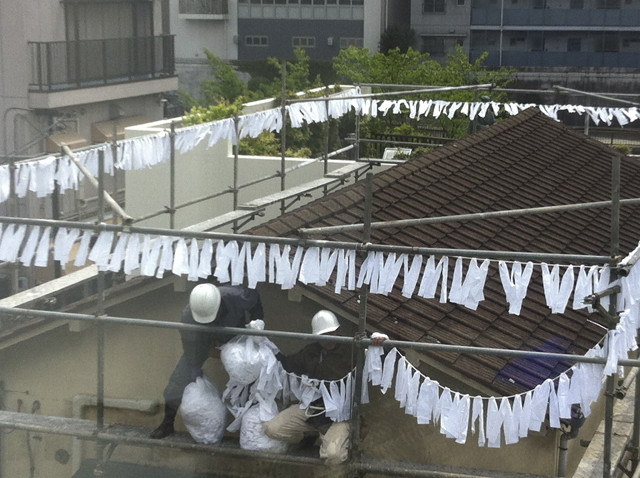 4 macho men in flaring jodhpurs set up scaffolding around the 80 year old two storey building across the lane from our house, next to O Deki Shrine. 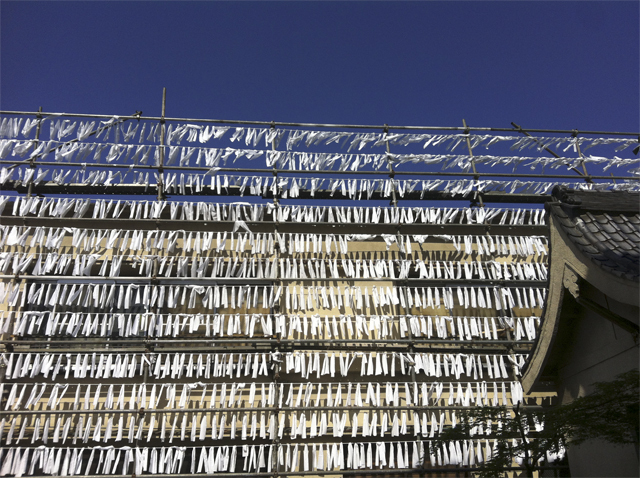 One week later two handsome men in white helmets climbed the wobbly scaffolds and started stretching row upon row of white ropes spliced with narrow strips of white cloth. 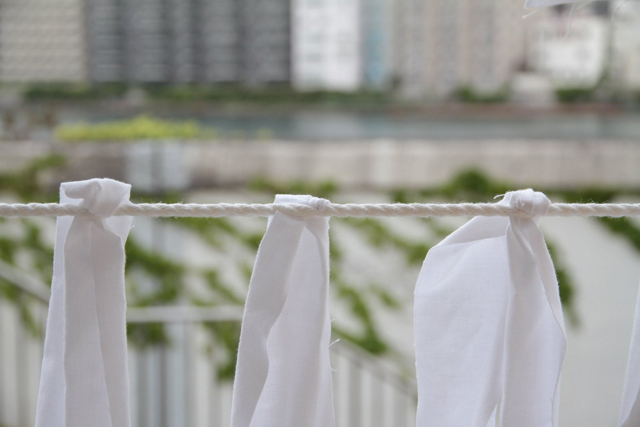 Mesmerized, I watched and photographed them as they strung their fluttering banners, wondering where they were going. 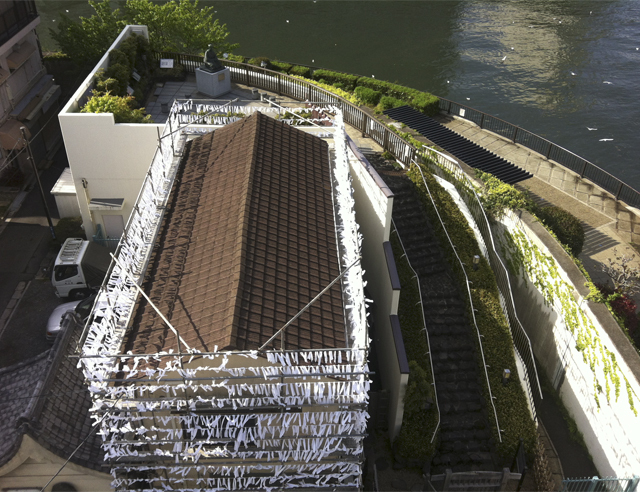 May 1, the exhibit Weather Station opened at Bansho Gallery, at the confluence of the Sumida River and the Onagi River, a place of spirit and history where Basho once lived and wrote his endearing haiku. 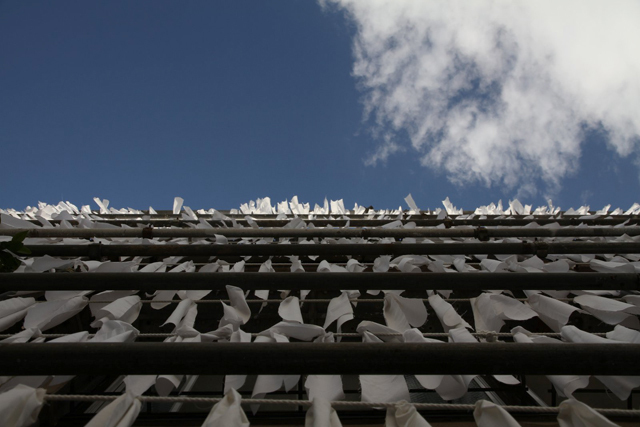 15 rows of waving banners flapped from the ropes tied to the scaffolding creating energy and motion and Blue & White excitement to our neighborhood. Because I can’t bring this exhibit to Blue & White, let me bring it to you digitally and hope that you will absorb the marvel that Fujii Tatsunori has conjured up at Bansho Gallery. 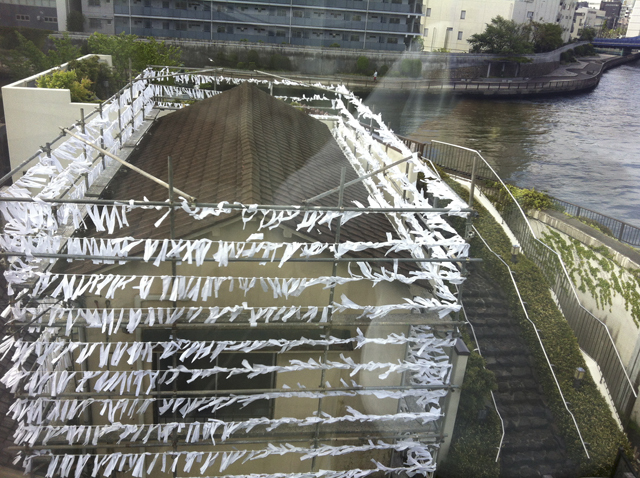 Christo would be impressed! 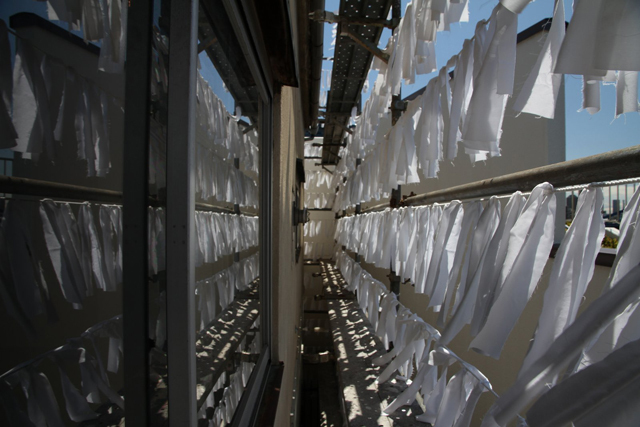 BLUE & WHITE WEATHER STATION on Basho’s iconic Sumida River by Tatsunori Fujii, at Bansho Gallery, Koto ku, Tokyo. 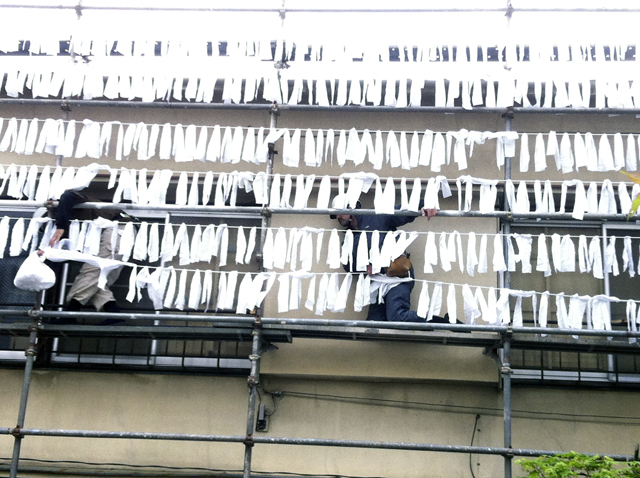 Tatsunori Fujii and his side kick laying out the lines of prespliced strips of cloth. 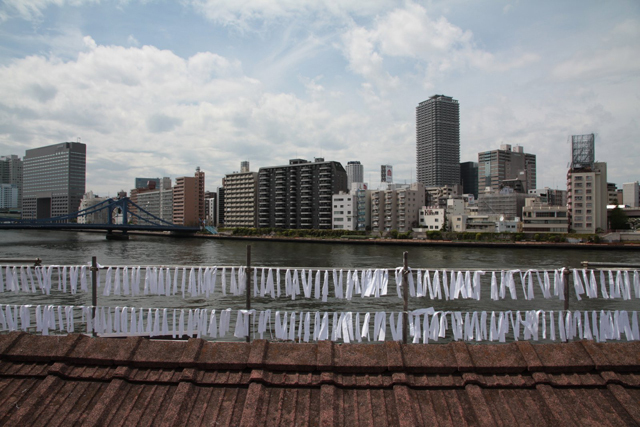 Flags on the Sumida River or could they be prayers? 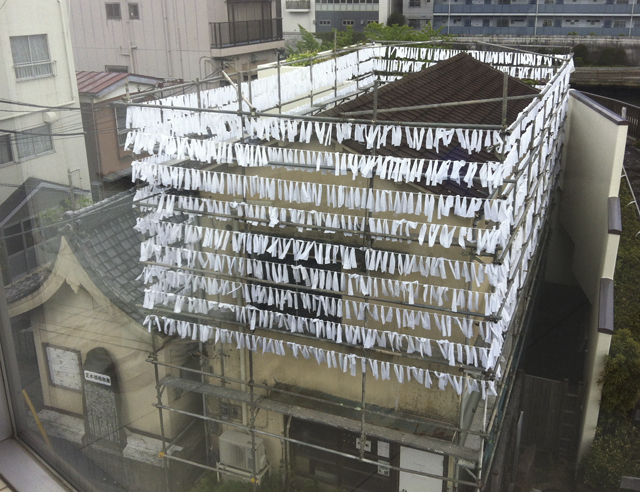 Remarkably, Tatsunori Fujii’s Weather Station Exhibit at Bansho Gallery takes place both inside and outside of the old building. The artist and his assistant come to the bottom of the installation. can really see the entire concept. Are you politely telling me that as usual I got carried away with so many photos ? I have to say I couldn’t get enough of that amazing installation. So happy to hear from you ! Splendid! This is inspiring indeed! And may I say, I love all the different angles and perspectives you managed to capture. If you got carried away, it was a great thing. Especially the smiles on the men’s faces as they made their finishing touches. THANK YOU!